Kansas Donated Dental Services (DDS) has exceeded $10 million in comprehensive dental care contributed by volunteer dentists and dental laboratories to people with disabilities or who are elderly or medically fragile and cannot afford care. The program was started in 1996 by Dental Lifeline Network • Kansas in conjunction with the Kansas Dental Association. Kansas DDS has made it possible for 3,265 people to receive life-changing dental treatment since its inception, including DDS patient Harold. Harold is a retired railroad worker. For more than 10 years his painful dental problems nearly prevented him from eating. Three DDS volunteers came to Harold’s rescue. 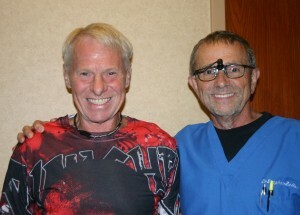 Dr. Stephen Zeller, an oral surgeon extracted Harold’s remaining teeth and Dr. Michael Gardner, a general dentist, donated full upper and lower dentures. Midwest Handcraft Dental Lab contributed fabrications. Harold is much happier and can eat again. Read full press release.